Jack Fleck in March 2012. FORT SMITH, Ark. (AP) - Jack Fleck, who produced one of golf's greatest upsets by beating Ben Hogan in a playoff to win the 1955 U.S. Open, died Friday. He was 92. He had been the oldest living U.S. Open champion. The Edwards Funeral Home said Fleck died after a brief illness. Jim Edwards, the general manager, said he saw Fleck hitting golf balls as recently as six weeks ago. Fleck returned to The Olympic Club two years ago when the U.S. Open celebrated its champions at the San Francisco course. 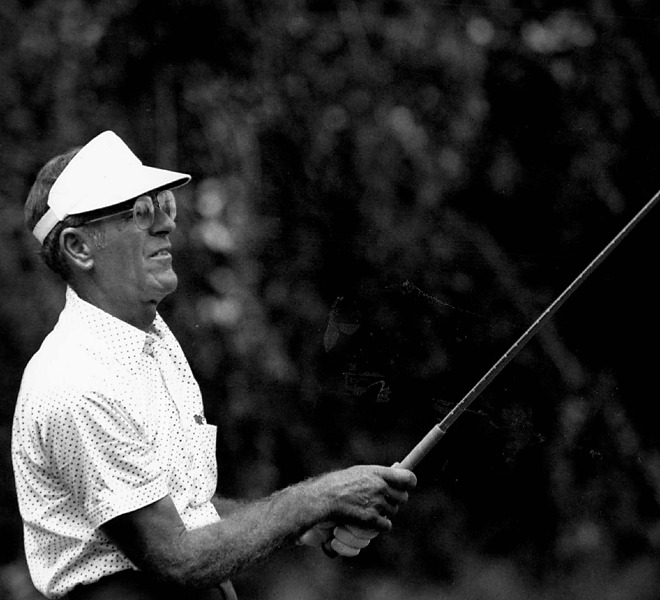 Hogan appeared to be on his way to a record fifth U.S. Open title in 1955, closing with a 70 to finish at 7-over 287. He already was being congratulated by players who figured no one could catch him. But Fleck, an Iowa club pro in his first year on the PGA Tour, made two birdies over the final four holes for a 67 to force a playoff. Fleck shot 69 in the playoff to beat Hogan by three shots. ''It was like someone who had never won a tour tournament beating Tiger Woods today,'' Fleck said in a 2002 interview with The Associated Press. Fleck won only two other events on the PGA Tour. He also won the Senior PGA Championship in 1979. But it was that U.S. Open title over Hogan that made him famous. Fleck said he was advised to save his energy when he arrived in San Francisco, but he loved Olympic so much that he wound up playing 45 holes of practice on Monday and Tuesday, and 36 holes on Wednesday. ''I heard a voice that said, `You are going to win the Open,''' Fleck said. Born on Nov. 7, 1921, in Bettendorf, Iowa, Fleck learned the game as a caddie in Davenport, Iowa, where his father was a farmer. With borrowed clubs, he did well in caddie tournaments and, when he graduated from high school in 1939, decided to head south to Texas to play golf and escape Iowa's harsh winters. He served in the Navy during World War II and saw action during the Normandy invasion on British rocket ship off Utah Beach. Fleck resumed his golf career in 1946 and scored his breakthrough victory in the 1955 U.S. Open. Fleck won only $6,000 for that major title - last year's U.S. Open champion, Justin Rose, earned $1.44 million - and made money by doing exhibitions. Fleck won his first senior title a year before the 50-and-over Champions Tour began. He later won the senior division of the Legends of Golf. He played the senior circuit regularly until 1991, when he devoted his time to teaching and running Li'l Bit of Heaven, a golf course he designed in Magazine, Ark. Fleck is survived by his wife, Carmen; his son, Craig; a granddaughter and a great-granddaughter. Services are Tuesday at the First United Methodist Church in Fort Smith.